When people remember the beginning of the American Revolution, they usually think of the “shot heard ‘round the world,” fired in 1775 in Concord, Massachusetts, or the bloody battle at Bunker Hill. But America’s path to independence really began in August of 1776 with the Battle of Brooklyn, the first military engagement following the adoption of the Declaration of Independence in July 1776. The fighting raged in and through areas that Brooklynites travel every day. Significant battlefields included Gravesend Bay, and today’s Green-Wood Cemetery, Prospect Park, Fort Greene Park and Fulton Ferry Landing. The Old Stone House was the culminating site of what was the largest battle of the Revolutionary War. On August 30, 1776, Maryland Major Mordecai Gist wrote, “The principal loss sustained in our battalion fell on Captains Veazey, Adams, Lucas, Ford, and Bowie’s companies. The killed, wounded, and missing amount to two hundred and fifty-nine.” Where those killed are buried is uncertain to this day. The outcome of the Battle of Brooklyn was a victory for the British, who killed or captured 1,000 Americans and proceeded to occupy Brooklyn and Manhattan for seven years. However, the British failed to capture Washington and his army, which withdrew across the East River to fight again and, eventually, win the war. In 1783, the British finally surrendered, sailing from New York in defeat, and America embarked on its destiny as an independent nation. The Declaration of Independence was signed in ink at Philadelphia … and signed in blood at Brooklyn. We are gathered today in the presence of the Roman goddess, Minerva, beside the Altar of Liberty on which she rests her palm. For the Romans, Minerva was the goddess of wisdom, the arts and crafts, medicine and doctors, commerce – and, as if she didn’t have enough hats, she was also the goddess of strategy and battle. To the Romans, the root of her name, Men-, meant mind, and to the Greeks, memory. And that is why we are here today – to remember. Our Minerva faces another statue, across the water, the Statue of Liberty, and where Minerva wore many hats, she only wears one, a crown, but what she holds high is the flame of Liberty. Look at her out there. Tall. Magnificent. Which way does she face? It is a good question for parlor games. Does she face the Narrows, to welcome immigrants who gave up everything to be free? No. Does she face Manhattan, the greatest city in the world? No. Does she face New Jersey? Not likely. No, she faces east, some say toward France, her home – but others believe she is looking at this hillside, where, on August 27th, 1776, the embers of the American Revolution burst into flame. She knew, and she remembers. I believe that it is no accident she faces us. I’ve been unable to find proof, but consider these facts: The significance of the Battle of Brooklyn was recognized immediately in its aftermath, and 100 years later Walt Whitman celebrated the battle in his great poem The Centenarian’s Tale. When Lady Liberty arrived here in 1885, there could be no question where she should face: she should face Battle Hill, right here, and, down there, Battle Pass, in Prospect Park, and still further on, the Old Stone House in the Gowanus valley, where two companies of men from Maryland and Delaware delayed the great British army long enough for the rest of their compatriots in the field to escape. We are gathered today to remember the Battle of Brooklyn, and to mourn and honor the 1100 men who were killed or captured during the battle. We are also here to remember, mourn and honor the men captured throughout the war who were imprisoned on miserable, stinking ships just up the East River; men who were starved and beaten; men who when they died were tossed into the river to be forgotten. We do not forget them. We remember. 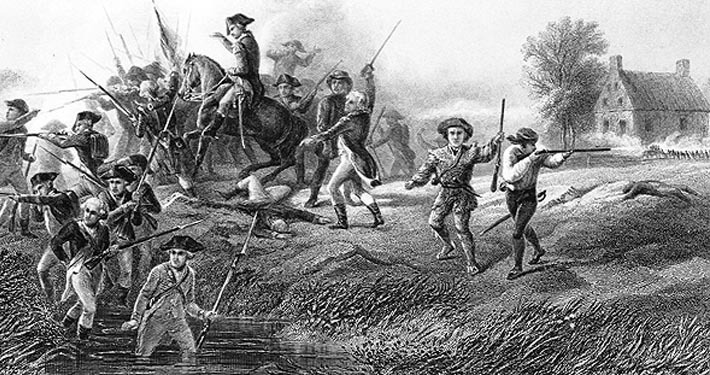 This first battle of the American Revolution was fought by a truly American Army, by men not just from New York, but also by companies from Massachusetts, Connecticut, New Jersey, Virginia, Maryland, Delaware and Pennsylvania. They came together, as Americans, to defend the Declaration of Independence. The Declaration was seven weeks old then. It had been read aloud in New York for the first time on July 9th, just six weeks before the battle. The ink was barely dry, yet these men heard the call, and answered it. The Continental Congress had promised General Washington 50,000 soldiers. Only about 15,000 had materialized by mid-August, and 3000 of those were sick from bad water, bad food, and whatever else got passed around in makeshift campsites. Across the harbor on Staten Island, the British, led by General William Howe and his brother Admiral Lord Howe, had landed 35,000 soldiers and sailors, brought by 450 ships that included 74 ships of the line, each carrying more that 60 cannon. They came to put down revolution. The details of the Battle are familiar to many of you: it was a hard, vicious fight, and many newly-minted Americans died of shot, saber and bayonet; others drowned attempting to escape across the Gowanus. 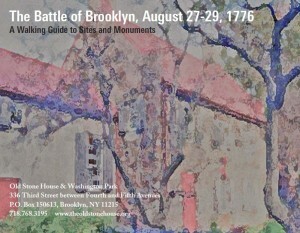 There is no question that the Americans lost the battle in the field and that night the balance army was trapped on Brooklyn Heights under General Washington’s command. But the British did not succeed in their goal of destroying the American army. On the second night after the battle, under cover of fog and darkness and in total silence, General Washington moved his remaining army of 9000 men, all their supplies and weapons, and all their horses, across the East River and escaped. They would fight again. More than a month later, when the news of the Battle of Brooklyn had crossed the Atlantic, the Times of London reported on it, and noted that this escape was important, and that it did not bode well for any quick defeat of the Americans. A few weeks later, on our country’s first September 11th, Benjamin Franklin, John Adams, and Edward Rutledge rowed across the water from Perth Amboy, New Jersey, which the Americans held, to the southern tip of Staten Island, landing at a handsome stone house that is now known as the Conference House. They came to meet General Howe, and Admiral Lord Howe. For three and a half hours, they discussed how to avoid what was about to become a terrible war. The only solution the Howe brothers had to offer was to give the Americans the chance to lay down their arms and pledge allegiance to the crown. The Americans declined, politely. They did hang together for seven long years, leaders and soldiers fighting so that all Americans would be considered equal and the laws would apply equally to everyone. They stood firm for freedom of speech, for freedom of assembly, for freedom of religion, and for the right to choose their leaders freely. Our task, as Minerva here directs us, is to remember this. We must retell the story constantly to remember it; our children must hear it, and so must their children. Recorded history organizes our memory and helps us understand events. It preserves what aging minds forget, what new generations push aside. We have seen that the story history tells can change. Holding history up to the light reveals its flaws, its fabrications, and its failures: In recent times, there has been fuller acknowledgement of slavery as our country’s great original sin, and also, attention finally has been paid to the women of the 18th Century and their roles and contributions. We revise history not to make it prettier; we do so to make it more precise and more useful. One keeper of the flame, a man who, over a hundred years ago, remembered, is here in spirit: Charles M. Higgins. He was an Irish immigrant, an entrepreneur and a civic leader here in Brooklyn. His first great success in business came from the manufacture of India Ink, which was used in pens and on presses throughout the world. Minerva, goddess of commerce, would have approved. That is his family’s mausoleum behind me, and he purchased these lots with the specific purpose of creating a memorial to the Battle of Brooklyn. It was he who ordered the sculpture of Minerva and the Altar of Liberty. It was he who lobbied city government to dig up the Old Stone House – which had been buried during the development of Park Slope – to create a park commemorating the battle, an effort that eventually succeeded. We are grateful: and because of him, we too remember. Our country is founded on some very basic principles, life, liberty and the pursuit of happiness. All men created equal. In expressing their courage, the men who fought for these ideals – and the women who made it possible for that to happen – were willing to give up their lives. Generosity is part of our national DNA. As a nation of immigrants, we have treasured ideas like those expressed on the pedestal of Lady Liberty, “… give me your tired, your poor, your huddled masses yearning to breathe free, the wretched refuse of your teeming shore.” These ideas are part of our nation’s fabric. We have cherished and strengthened them for 240 years. As has been often said, the Declaration of Independence was signed in ink in Philadelphia, and signed in blood in Brooklyn. The men fighting in the hills around us in August 1776 couldn’t have envisioned how the twists and turns of history would bring us to where we are today, but we must be grateful to them for their trust in the future. I think they would be immensely proud to know what has arisen from the bloody foundation they put down.